Defending champion Todd Frazier and current home run leader Mark Trumbo headline the participants in the 2016 Home Run Derby. The field was announced on Thursday's SportsCenter. The derby, which will take place Monday at San Diego's Petco Park, will follow the bracket format that began at last year's event.Matchups were seeded based on home run totals through Wednesday's games. Trumbo, the Orioles' right fielder, leads the majors with 26 home runs and will be the derby's No. 1 seed. He will take on No. 8 seed Corey Seager, who has 17 homers withthe Los Angeles Dodgersin his rookie season. Frazier, the White Sox'sthird baseman, is the No. 2 seed this year and is second in the American League with 23 home runs. He will take on No. 7 seed Carlos Gonzalez, who has 18 homers this season with the Colorado Rockies. Frazier won last year's derby, defeating the Dodgers' Joc Pederson in the finals. In the other matchups, No. 4 seed Robinson Cano of the Seattle Mariners (20 homers) is paired with No. 5 seed Giancarlo Stanton of the Miami Marlins (19 homers), and No. 3 seed Adam Duvall of the Cincinnati Reds (22 homers) matches up with No. 6 seed Wil Myers of the hostSan Diego Padres (19 homers). The All-Star Game will be played Tuesday. 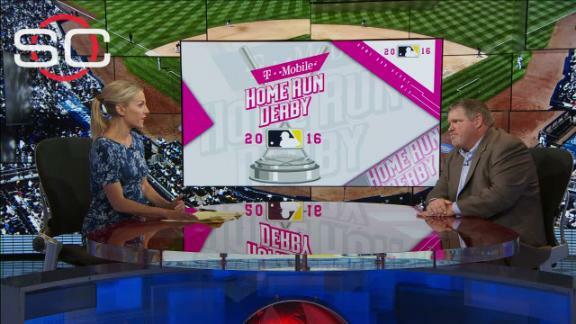 John Kruk explains why he thinks Mark Trumbo and Giancarlo Stanton will defeat Corey Seager and Robinson Cano respectively in their first-round matchups at the Home Run Derby.